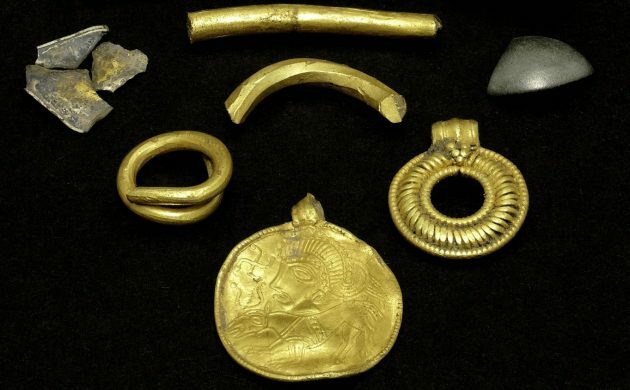 A father and his two sons have found a 1,500-year-old golden amulet in a field at Magletving on Lolland. “It is a really exciting and unique find for us,” Marie Brinch, the curator at Museum Lolland-Falster, told TV ØST about the find by Carsten, Lauritz and Lukas Heln. The amulet (or bracteate) is a small, round, thin golden disc with a decorated front that is framed by a gold thread. It has an eyelet for a cord or chain, so it could be carried around the neck. Archaeologists have determined the image on the amulet most likely portrays Odin, the king of the gods who was also the deity for war and death, because there is a small runic inscription with the words ‘The Tall’, which was one of Odin’s nicknames. “Only three [of these amulets] have been found on Lolland – the last one was back in 1906,” Brinch said. The amulet was discovered along with a gold pendant, three broken golden pieces (probably neck rings) and a golden ring – all dating back to 6th century. According to Brinch, most of the uncovered golden artefacts from prehistoric Denmark come from this period, which may be linked to a major natural disaster that took place in 536. It is believed an atmospheric dust veil from a large volcanic eruption or debris from space caused extreme weather changes in the northern hemisphere, which led to a prolonged winter and famines around the world.